Dec. 4 – Drone developers are increasingly attempting to mimic the flight mechanics of birds an insects for the next generation of miniature, autonomous aircraft, but one researcher in New York, has found inspiration in the sea. Leif Ristroph of New York University is developing a robot that replicates the pulsating motion of the jellyfish as an alternative drive system for future drones. Sharon Reich reports. 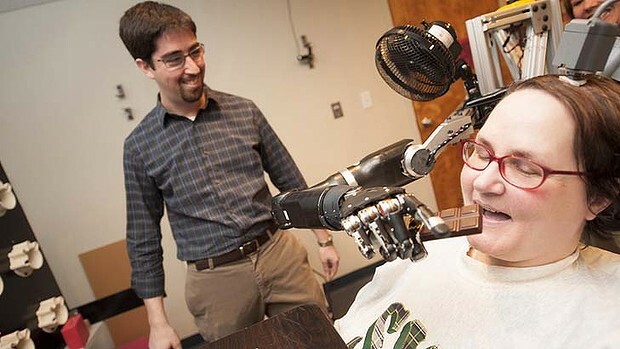 A paralysed woman has been able to feed herself chocolate and move everyday items using a robotic arm directly controlled by thought, showing a level of agility and control approaching that of a human limb. Jan Scheuermann, 53, from Pittsburgh, was diagnosed with a degenerative brain disorder 13 years ago and is paralysed from the neck down. These electrodes are remarkable devices in that they are very small. You can’t buy them in Radio Shack.